Click Here to GET STARTED, the application, guidelines, and evangelism course. How to begin? Pray! Seek God's direction as you would for any new ministry in the church. Settle for nothing less than God's perfect peace and anointing. Meeting at the church for a Saturday morning ride together for breakfast.. Encouraging motorcycle riders to ride their bikes to church, complete with riding apparel, and providing a special place for bikes only parking. This could establish a "biker friendly" atmosphere which will help visitors who ride feel welcome and comfortable. Encourage riders in the church to bring their bikes to other church functions. People are fascinated with motorcycles. Have bikers in the church sell or auction off rides to church members to raise money for mission’s projects. Meet at the church to ride to other motorcycle events in the community. How to begin? Pray! Once again seek God's direction, wisdom and anointing as you take this ministry to the next level. Biker specific events can be scheduled to begin establishing a relationship with the motorcycle riders in your community. Men and women already involved in fellowship activities may be ready to take their fellowship rides to the next level. Decide whether these events are intended to be evangelistic outreaches or fund raisers. It is very difficult to combine the two. One thing that really tears down walls that exist between the church and the world is to not charge or accept donations. It provides a perfect opportunity to explain "Free Grace". Biker Sundays - Like any other special event at church, success will depend upon individual involvement. Simply declaring any given Sunday to be a "Biker Sunday" may not guarantee success. Non church riders will come because they have been personally invited by someone in the church. Encourage church folks to dress casually for that service, provide special parking and a free meal after church. Information is available from HonorBound Motorcycle Ministry on how to put on a bike show or hold bike games. Share the gospel and provide an opportunity to respond. Bike Show - A free bike show complete with free food and trophies will attract local riders. 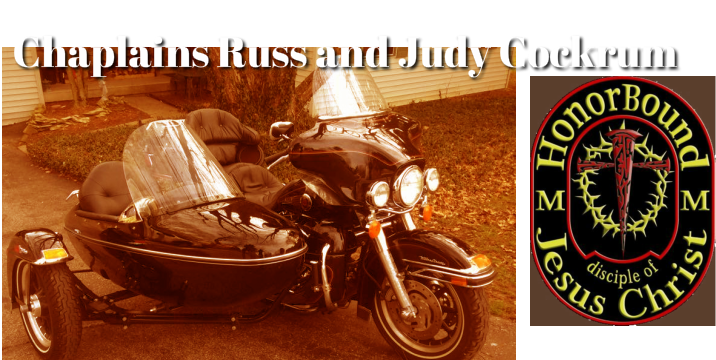 HonorBound Motorcycle Ministry can provide information on how to best conduct such an event. If your church is located on a main street or highway in your community, the church parking lot may be a good choice. If not, shopping center or supermarket parking lots are often available. End with a brief presentation emphasizing God's love and forgiveness. Hospitality Tent - If your church is near a major motorcycle event or on a heavily traveled rout to or from one, you may be able to set up a tent to give out free coffee, ice water and snacks. Evangelism material can be available as well as someone willing to pray with anyone in need. Highway rest areas, motorcycle dealerships, swap meets and bike races are all possibilities. Permission is always needed. Sometimes you may have to pay a fee to set up as any other vendor. Bike Blessings - This can be done in conjunction with other events or as an event of its own. We're not really blessing a machine, but praying for the rider and passenger. Ask if there is anything specific you can pray about for them. If someone invites you to pray with them about anything they have opened their heart just a little to receive more of God farther down the road. Free Bike Wash - This means free, no donations, no tips. Offer them a cup of water or coffee while you wash their bike. Provide and encourage them to read a short evangelism tract you have ready. When finished offer to pray for them about anything. Be prepared to answer their questions about "Why are you doing this for free?" Toy Runs - A toy run is a motorcycle ride usually of less than 100 miles with the intent of collecting toys for kids around Christmas time. Bikers donate a new toy to be able to make the ride. Free food is good. Some of the hardest bikers have a soft heart when it comes to kids. What better chance than to explain what Christmas is really all about. Hospital Visits - If you have a way of knowing about bikers who have been in accidents in your area and have someone in your church that can relate and is willing to make these visits, incredible ministry opportunity is available. Motorcycle Riding Fellowship - Motorcycle riders within the church who wish to identify as a group for the purpose of fellowship and evangelism within the motorcycle community. The motorcycle community, like many other sub groups within our culture, has its own set of rules and protocol. HonorBound Motorcycle Ministry is available to help any church who would like to establish a motorcycle ministry. How to begin? You already know this one. Pray! Seek God's direction, anointing, wisdom, boldness, protection and that the right leadership is in place to begin the next step. Do you have men and women who are true disciples? Riders in the church who are maturing believers with a love for motorcycles and the people who ride them, with a desire to commit to more than fellowship, more than an occasional outreach to the local biker community? Jesus' disciples did more than just enjoy His teachings and one another's company. They brought others to Jesus. They were recognized in their community as disciples of Jesus. The next step in motorcycle ministry is a core of committed riders called to ministry to bikers, willing to become informed in the rules and protocol of the biker world and ready to do what ever it takes to bring unsaved bikers to a relationship with Jesus. These individuals may be interested in becoming a part of HonorBound Motorcycle Ministry.